"If you'll come with me, you'll float too." Like most "good" horror movies of today's time, evil is typically personified into something supernatural, like a ghost, or a sexually contracted disease if you've seen the film, It Follows. In Its case, a demonic clown epitomizes evil. However, the real evil is not in any of these supernatural entities. It is rooted within something more mundane and quotidian that effects each and every person on this planet. Putting Its stunningly, bleak cinematography aside, the real feat that It also accomplishes is its ability to have its audience revel in the nostalgias of the 80's while simultaneously exposing us to the dangers of childhood trauma. It follows the story of a group of young children who are terrorized by a demonic, shape-shifting clown named Pennywise who resurfaces every 27 years to feed off the fear of the children of their town. The biggest change in the film from its original source material is its time jump from the 50's to the 80's. Not only does give its audience members something to relate to as most of them would remember this period, but it also makes the thought of a sequel much more appealing as it would take place in modern day society, literally 27 years later. In the film, all the kids fear something. Regardless of whether it involves a real fear like Beverly's (Sophia Lillis) fear of her pedophilic, abusive father or a completely idiosyncratic one like Eddie's obsessive fear of sickness (Jack Dylan Grazer); It proves that as a child, every fear that one has, whether they're organic or not, feels real and they should not be ignored or invalidated. Though the film sadly only illustrates what these real-life fears are during some of the scenes, the film does makes it a point that it is important to tackle fears like these during one's youth so that they'll be able to conquer the bigger and more ambiguous fears that come with adulthood. Pennywise's character not only symbolizes the fear our own mortality that only frequents adulthood, but his character's actions also reflect what will happen if we indulge in our fears, in general, too much. This is because in doing so, we won't be able to deal with the problems of adulthood because we'll be so consumed with the ones lingering from our childhood. Being consistently afraid of something has been scientifically proven to inhibit growth mentally, but even though Pennywise stunts physical growth by way of fear, the film symbolically exemplifies this point by making them synonymous with one another. According to It, when it feasts on scared humans, all the chemicals of fear flood the body and salt the meat, which makes them better for his consumption. He also taunts them with the unnerving threat that "they'll all float, too", which simply means that once they're dead, they will float in his underground sewer home as dead bodies float tend to float in water. When Pennywise kills people, they do not go to Hell or Heaven. They float in a limbo-esque area forever with their souls still attached to their unnerved unconscious bodies and they seemingly stay children forever, meaning that the simplistic fears that these children have that are actually inhibiting them from growing physically if Pennywise gets ahold of them. Although he is not opposed to eating adults, it is much easier to take advantage of a child's fear than that of an adult's. 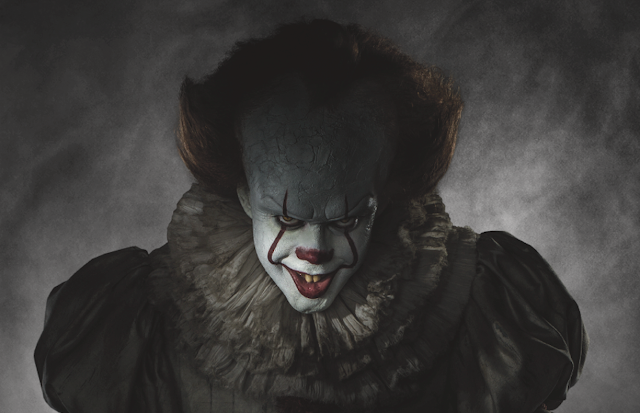 Adults fear more ambiguous things like the inevitability of their own death and those fears are much harder for Pennywise to manifest into a physical form. Towards the end of the film, Pennywise takes of the leads captive, he tells the others that if his friends allow him to take him, they'll be able to "grow and live happy lives until old age drags [them] back to the weeds" (i.e., death). While the children probably do not realize this about Pennywise's threat because they're so young, he is exemplifying the idea of dying of old age as something to be afraid of. Although he is allowing them the peace to do so, he's taunting them with the fact that even if they let him take their friend to die, they, too, will die at some point as well. Many people cannot handle the idea of their own mortality and as with the children and their fears; they attempt to try to live their lives simply avoiding it until they must come face-to-face with it. However, after they have overcome Pennywise subjecting them to their greatest fears, the children no longer have anything to be afraid of, except the fact that they'll still have to die eventually. Since it is quite hard for Pennywise to manifest the idea of one's mortality into a physical form that he taunts them with those words. Moreover, even though this does not phase the children because they're so young, the line works because it gets to us as this is seemingly what most of us fear. Nevertheless, at the end of the day, the film is about children and they simply do not think about things like this. I can only hope that the sequel will touch on themes that of mortality one as the kids will have grown the mental capacity to think about things like this. As for It, it's the bond the loyalty and love that these children have for one another that aids them in defeating Pennywise. It is also what makes transcends this film beyond just another horror flick and more into the realm of an offbeat coming-of-age film. During the scenes where our leads are frolicking in the water and battling bullies together simply being kids, the film shines. It's the warm-heartedness of these moments that highlights the innocence of these characters. It also is what reminds of a time when we didn't have to worry about existentialism and being aware of our own mortality. While it's what gives us comfort while we watch these children battle their own demons, we must realize that the only reason that we're at this point is because we faced our own fears when we were their age. Often when we have children in an R-rated setting like this one, we forget that they're children and even though they're going around battling demons and swearing left and right, it is through these moments that we remember who and what we're watching and how we're not much different from them.